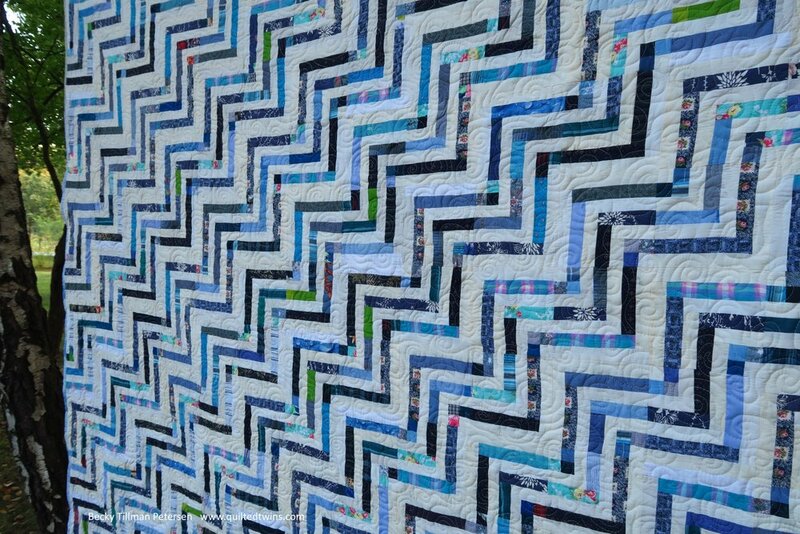 This is number 22 in my upcycled blues series of quilts. I was able to finish it up completely not very long ago now. I’m not being very original with the quilting, am I? I am still working on perfecting it! That’s why you keep seeing it! I like how this one does look like you are sitting in empty bleachers when it is facing this direction. I tried hanging it various ways and it doesn’t necessarily give the same effect from other directions! It used up quite a lot of my 1.5” strips of various blues. It did go together rather quickly in spite of the fact that I was working with such tiny strips - and I was able to incorporate quite a few various whites/off white second hand fabrics as well. I talked about making this quilt top here. The pattern is on the free patterns page and I’ve updated it with new pictures. I forgot to take a picture of the back. Sorry about that. I did piece the back, though - the whole thing except for thread and batting is from upcycleds! Here’s the quilt roll. Remember! You can always find out what’s up with this project by heading on over to the upcycled blues page on the website. It’s all in one place there. As I finish patterns, I’ll put them on there as easy downloads. They are also on the free patterns page. Don’t forget to check out what fun things my sis has for you over in the store!